Wim got two new knees! HAPPY: For six long years Wim suffered with agonizing pain in both knees. He had been through seven operations, but doctors could not be of help. 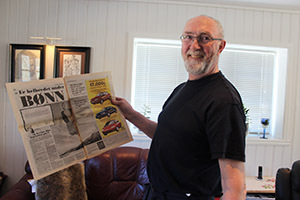 During the meeting at Geilo in 1995, he was instantly healed . 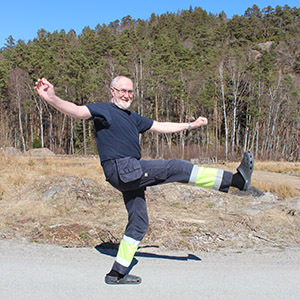 In the course of six years, Wim Van Pelt ( 62 ) from South Audnedal had undergone seven knee surgeries. The daily pain made his life very limited. At a meeting in Geilo in 1995 he received prayer where Jesus performed the perfect operation. Later thousands of people heard his miracle story through newspapers and television. One day in June in 1989 Wim injured his knee. A rough encounter with the door frame in the hallway was the start of long lasting excruciating pain. After some demanding days on the couch with ice packs and agonizing pain, he made his way to the doctor. The knee looked like a balloon and the swelling was very severe. An X-ray examination at Mandal hospital showed that the kneecap was cracked and the meniscus was destroyed. He was therefore put on sick leave from his job as an electrician. In December 1989 Wim had surgery performed. Soon he was back in the part time position as an electrician, but the pain was still there. The operation was thereby proven ineffective. -The knee pain was dreadful. The pain was so immense that I could hardly sleep. I took six to seven Codeines every day, as well as sleeping pills. Eventually I was on sick leave again. The doctors discovered now that the meniscus was still damaged and inflammations had set in. A second operation was therefore carried out in the left knee, but the pain did not disappear this time either. -Gradually I began to limp, and soon the pain in the right knee emerged as well. Recent examinations showed that the meniscus was damaged. A second operation was carried out, but the pain did not go away then either. The knee ailments made everydaylife very confined. It was hard to walk, bend, drive and work. Eventually he had to use crutches. He consumed painkillers every day. -I eventually got a pretty high pain tolerance. In 1991 I quit my job as an electrician. It was hard, because I was a person who liked to be active. The operations now came one after another. Altogether I had four operations on the right knee and three operations on the left knee. For Wim it was very frustrating that every operation was ineffective. He was therefore very skeptical when the doctor proposed their last two options. One was getting an artificial knee, but then he had to wait a few years. The second was to have an extensive and complicated operation that would change the whole leg placement. -The latter meant wearing a cast for eight months, and undergo a year of rehabilitation. This applied to both knees, and I would thereupon be constrained for several years. I was therefore very skeptical. -Is that how it goes? Then there is not much we can do to get you out into the workforce again. In the fall of 1995 Wim's mother-in-law wanted to treat Wim and his wife with a vacation. Wim envisioned a cozy trip to Denmark. When he heard that it was about a healing seminar at Haugen Hotel in Geilo where evangelist Svein-Magne Pedersen was going to pray for the sick, he was very sceptical. -I was a Christian, but did not have much faith in that. What in the world! I thought. Yet it was difficult to oppose both the wife and mother in law, so I just had to go, Wim says laughingly. .
On the weekend of October 6-8 in 1995 they therefore went to Geilo. When he got to the hotel, he was no less apathetic. At the first meeting nothing happened with Wim. He had originally planned on resigning from the second meeting, but joined in regardlessly. At the meeting Wim was approached by a reporter and a photographer from the newspaper Aftenposten who sat beside him. They were going to write an article from the meeting. The journalists asked if they could write and take pictures when Pedersen prayed for Wim, something he permitted. -They asked me if I believed in this, and I said yes, but in my heart I had no belief in the prayer. It was very obvious, since my body language was very negative. It was a long wait for prayer and Wim had difficulty standing. Constantly he had to sit down to rest. When Pedersen finally prayed for him, Wim felt that his kneecaps began to vibrate. It was as if something was pushed into place, and he noticed that something was sucked out of the knees. Suddenly the pain was gone. "I'm healed, and all the pain is gone!" Wim said ecstatically. He both walked, ran and jumped down the meeting hall, and Aftenposten's photographer snapped many pictures. - To experience a healing was very extaordinary. It was so powerful. I could not deny what had happened, because I went from extreme pain to zero pain. Aftenposten's journalists who interviewed me, did not know quite what to think. They had seen my skepticism and that I barely was able to walk. Now I was healed and was running around. They probably struggled with my comments, says Wim and laughs out loud. When Wim came home, family and friends were overjoyed. On Monday morning October 9, 1995 a long article in Aftenposten was posted from the meeting. The TV channel TV2 called him because of the newspaper article. They wanted Wim to be be a guest in the talk show "Lønning Direkte» with regards to healing. -I showed up at the studio on Thursday October 12 where there were both atheists, priests and doctors present. Svein-Magne Pedersen debated, and was allowed to pray for the sick at the end. The program manager questioned me about what had happened, and I got to testify for the entire Norwegian population, says Wim. Surveys showed that 604 000 watched this program. It was the week's most-watched program on TV2. Later several media outlets made contact, including NRK Sørlandet, Fædrelandsvennen newspaper and Lindesnes newspaper. Shortly thereafter, Wim went to see the doctor, who examined him. In the medical certificate he wrote that Wim was healed through prayer. Soon Wim began working again. Later the newspaper VG heard of the account and on April 16, 1997 Wims story was on the first page titled «Healed during prayer, the doctor confirmed». The newspaper also had a copy of Wims medical certificate. -I am grateful for what has taken place. God also used my healing to motivate others to seek Him, and I'm glad. I'm sure many have come to know the Lord because of this healing. Yet it is not healing that is the most important, but salvation. Healing lasts for a while, but salvation lasts forever, Wim concludes. TESTIFIED: On Wednesdag April 16, 1997 Wim was interviewed by the newspaper VG where he told his story. -I hope that many will get saved through my testimony, he says.